She argues that our fossil fuel dependency is a vulnerability. Operation Free advocates for policies that support clean energy technology and reduce America’s oil consumption. 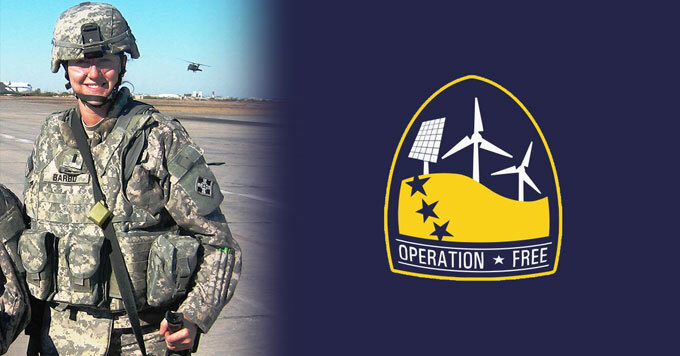 Energy is critical for military operations. From flashlights to vehicles, everything must be powered up and ready to go. It’s a lesson veteran Sarah Barbo learned firsthand during her tour in Iraq. Where that fuel comes from has major consequences. That reliance on foreign oil worries Barbo. So when she returned from Iraq, she joined “Operation Free”. It’s a coalition of veterans and national security experts who believe reducing this dependency is critical to protect our national security and our men and women in uniform. Operation Free advocates for policies that support clean energy technology and reduce America’s oil consumption. For members of Operation Free, it’s not just a climate issue. Dependence on foreign oil is also a military and national security concern. Image graphic: Created by David McCarthy. Photo of Sarah Barbo: Courtesy of Sarah Barbo.